After announcing their Aspire S3 Ultrabook at IFA Berlin, Acer has now turned around and denied claims of an ARM notebook in the works. Earlier rumors did indicate that a Tegra 2 powered notebook would be made available by the company, but that no longer appears to be true. 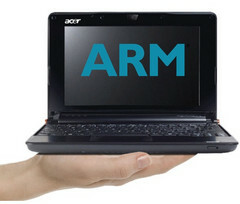 According to Charbax of ARMdevices.net, a high-ranking Acer product strategy manager confirmed that no ARM powered laptops will be released by the company before the advent of Windows 8. The Acer official, who is involved with the company's Ultrabook division, was present at the IFA conference in Berlin, and said that no such devices should be expected before the beginning of next year. An Acer ARM notebook would definitely have been intriguing to say the least, but history has shown that consumers don’t take too kindly to low power laptops that are incapable of running Windows. Add onto that the fact that Windows 8 will officially support ARM devices out of the box, and we can definitely see why Acer held back on releasing any such laptop. In any case, if an ARM notebook is high on your list of priorities, then you can always begin the search for one of Malata’s elusive Tegra 2 notebooks; just as long as you let us know if your quest yields any results!